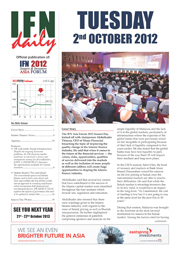 Following the tremendous success of last year, the 7th IFN Asia Forum will be held in Kuala Lumpur, Malaysia on the 1st & 2nd October 2012. The renowned 'Issuers & Investors' format will again ensure both the buy-side and sell-side are fully incorporated in this 2-day event. 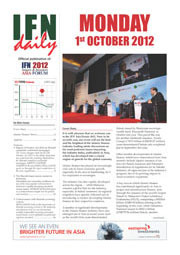 With complimentary delegate passes for all issuers, investors, regulators and other senior and relevant key practitioners, the IFN Asia Forum 2012 will continue to be the industry’s largest and leading annual event. The 2012 IFN Asia Issuers & Investors Forum will take you around Asia and explore these growth opportunities, question Asia’s exhibited resilience towards the world’s current financial woes, investor appetite for Asian-based investments and of course, their concerns. Through a series of exclusive regulatory country presentations, practitioner-led round-table discussions, non-debatable power presentations, original case studies and sector focused side sessions, the IFN Asia Forum in 2012 will again be the key, must-attend industry event for issuers, investors, regulators and all financial intermediaries involved in the Islamic financial markets with the slightest interest in the Asian markets.